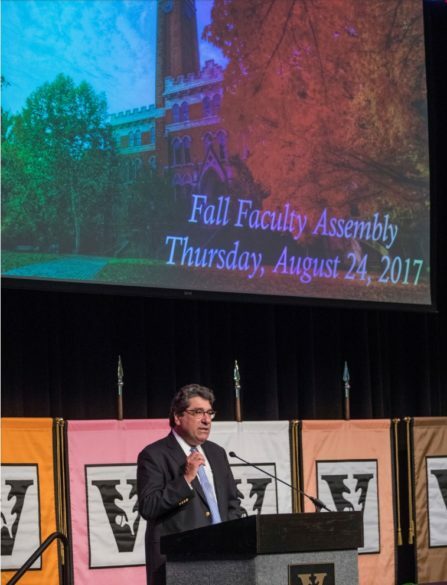 Chancellor Nicholas S. Zeppos cemented Vanderbilt’s commitment to excellence through initiatives that drive innovation and discovery, announcing a multimillion-dollar investment in faculty at the fall assembly on Thursday. Zeppos also announced a new library collections initiative that will award substantial new funding to faculty to acquire primary resources and research materials. The investment is critical to the humanities and arts, which rely on robust library collections. The College Halls system continues to grow, Zeppos said, with the new E. Bronson Ingram College on schedule to welcome students in fall 2018 and strong fundraising support furthering progress toward a full residential college system. In his remarks at the assembly, which kicks off the new academic year, Zeppos pledged to faculty that he is bound to them as they advance the institution toward its mission, despite current narratives undermining the value of higher education and research. Sharing those discoveries is the driving force behind the proposed Chancellor’s Fellows in Public Engagement. Zeppos said the program will deepen support for faculty so they can impart the impact of their achievements on the public stage, meeting the growing thirst for reliable, informed and thoughtful sources from trusted institutions. Vanderbilt’s steadfast commitment to diversity was evident at the assembly. Zeppos commented on the implications of the violent displays of racism, anti-Semitism, white supremacy, bigotry and hatred in Charlottesville, Va., earlier in the month. “Every day we must recommit ourselves to our values of diversity and welcoming and protecting the safety and dignity of every member of our community,” he said. He issued a welcome to new Vice Provost for Inclusive Excellence Melissa Thomas-Hunt, a recognized scholar in negotiation and a proven leader in inclusive leadership, and Interim Vice Chancellor for Equity, Diversity and Inclusion Tina Smith. Last August, Zeppos announced that the university was removing the “Confederate” inscription from Confederate Memorial Hall. When he noted Thursday that “for the first time, freshmen moved onto a Commons free of a stone pediment emblazoned with Confederate Memorial Hall,” the audience burst into applause. 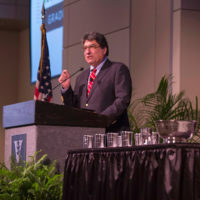 Zeppos noted that scholarship support puts “a Vanderbilt education squarely in reach of every deserving student, slashing student debt while recruiting every more talented and diverse students. The chancellor’s remarks came one day after the start of the fall semester and just more than 72 hours after the once-in-a-lifetime total solar eclipse that plunged the campus into two minutes of midafternoon darkness on August 21.